Many people are irate with FBI Director James Comey after he suggested that the FBI not be indicted by the DOJ. 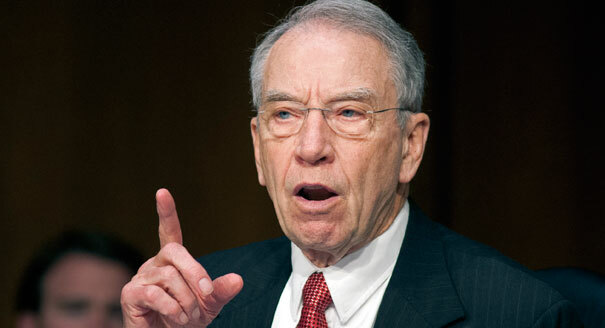 Among those angry Republicans demanding answers was Senator Chuck Grassley. He demands to know why the government is not charging Hillary Clinton. He labeled the investigation “suspect.” On top of that he has DEMANDED that the FBI turn over the information that resulted in their decision not to press charges against Clinton. “Prosecutorial decisions made under the shadow of apparent conflicts of interest are understandably suspect,” Grassley explained in a letter to Comey. No matter what type of explanation Comey grants there will be many who remain skeptical of this investigation. The only thing this investigation did was establish the Clintons as above the law. The scandal has showed time and time again how incompetent she is. This should haunt her through November and serve as a constant reminder of how she should be nowhere near the Oval Office. If you agree, share on Facebook and Twitter.